Apricots… if you ask me, so much better than peaches! I mean, I enjoy the taste of peaches but the skin just freaks me out. I know that apricots have a skin not too dissimilar but for some reason they feel totally different to me and my tongue. And they’re prettier than peaches too. Their super bright orange just makes me instantly happy. If they are perfectly ripe and juicy they are so sweet and perfect that I need to eat them straight away without any further ado. But when I have a bit more patience or when the apricots are not as ripe as I would have hoped for, I poach them with a bit of vanilla, orange and star anise and serve them on top of greek yoghurt. The perfect brunch on a sunny balcony on a summer’s day! Wash and de-stone the apricots by cutting them in half and gently taking the stones out. Add the sugar, water, star anise and orange peel to a wide pot. Using a sharp knife, split the vanilla bean along it’s length and scrape the black seeds out. Add both the vanilla seeds and the vanilla bean to the other ingredients in the pot. Heat over a low heat until the sugar is dissolved. Place the apricot halves in a single layer in the pan and bring the liquid to a gentle simmer. Cook the apricots like this for about 5 minutes, which will soften them. Be careful not to overcook them or they loose their shape! Take the pot off the heat but leave the orange rind, vanilla bean and star anise in it with the apricots while they cool as the flavours will continue to develop. Add some blueberries if you like and once the apricots and liquid has cooled down spoon some of the fruit along with the liquid over a creamy portion of greek yoghurt. 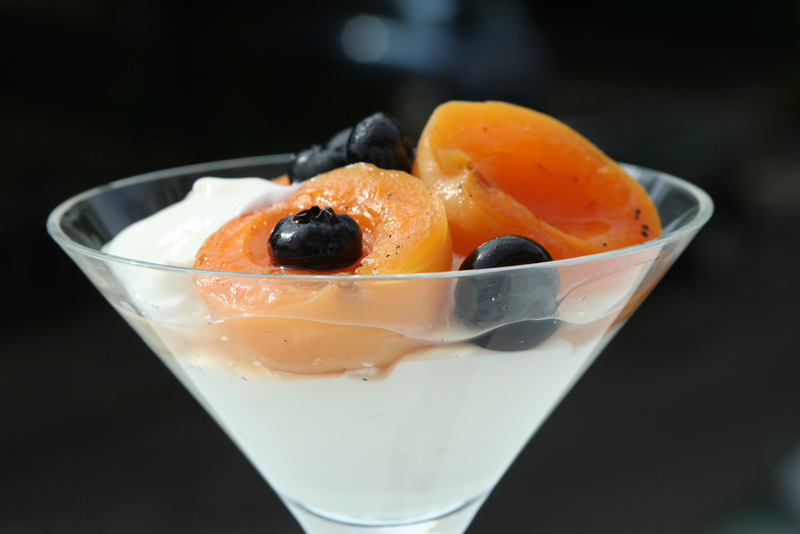 This entry was posted in Healthy and tagged apricots, breakfast, brunch, delicious, dessert, easy, easy recipe, gluten free, healthy, lowcal, lowfat, pretty, quick recipe, recipe, spiced, super easy, sweet, tasty, treat, yoghurt, yogurt. Bookmark the permalink.